The New Zealand is a breed of rabbit, which despite the name, is American in origin. The breed originated in California, possibly from rabbits imported from New Zealand. New Zealand rabbits are available in five ARBA-recognized colors: white, red, black, blue, and broken. Crossbreeding can result in many other variations, such as gold tipped steel and chestnut agouti. They average 10 to 12 lb (5 kg) with the does being slightly larger than the bucks. New Zealands are bred for meat, pelts, show, and laboratory uses, being the most commonly used breed of rabbit both for testing and meat production. They are also bred as pet rabbits. White (albino) New Zealand rabbit. New Zealand rabbits have well-rounded bodies; slender and muscular faces with round cheeks; large, long back feet; and small, short front pectoral muscles (Rubins). They have long perforated ears that stand straight up. Unlike the thick, snowy fur on their bodies, their ears have shorter fur that allows the delicate pale pink of their skin to show through. The most noticeable characteristic of white rabbits is their bright eyes, which are a ruby pink color. Due to their eye colour their colouring is often referred to as REW (ruby eyed white). REW is a recessive trait and epistatic to most other color genes in rabbits. White New Zealand rabbits have a genetic deviation called albinism. Albinism is caused by a lack of melanin, a pigment found in most organisms. The snowy coat of a white New Zealand rabbit is a normal length like other rabbit breeds. Most New Zealand rabbits also have a white/pink/light brownish tint to their noses. Though the ARBA treats all New Zealand rabbits the same, the BRC holds red New Zealand rabbits to a different standard. 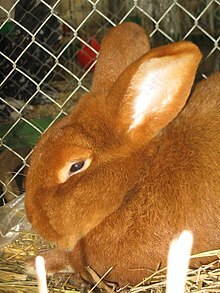 The Blue New Zealand rabbit is recognized in British Rabbit Club and United Kingdom. ARBA has recognized blue New Zealands since late 2016. When shown in competition they are judged primarily on body type. New Zealand rabbits were likely developed in California and developed from a mix of breeds, possibly including Belgian hares and Flemish giants. They were developed for their quick growth rate and meat type, and were added to the US rabbit standard in 1916. Originally they only came in red. The white variety was created in 1917 by William S. Preshaw out of some white New Zealands born in a litter of reds. While the reds remained more popular for meat for some time, whites quickly caught on because of their white pelt, which could be easily dyed and was more valuable in the fur market. New Zealand rabbits were not originally bred to be a domestic pet; they were bred for their fur and meat. Fryers are slaughtered at 8-12 weeks,  and older rabbits are sold as roasters. White rabbits are preferred for fur, because it's easier to dye. The rabbits with high grades of fur are used to make fur coats and fur trimmings. The lower grades are used to make felt hats and glove linings ("Commercial Rabbit Raising"). The New Zealand is commonly used as a meat rabbit with a high feed to meat ratio with fine bones. New Zealand rabbits are the most common meat rabbit in the United States (Bare 63-65). Production rabbits are fed more protein (18-20% rather than the typical 16-18% for non-production rabbits), and sometimes alfalfa hay. A doe (female rabbit) becomes fertile between 8-12 weeks of age and can be safely bred at 16-17 weeks of age. Breeding before this age can cause harm or death to the doe and/or kits. Does are fertile all year long although day length can affect that some. The gestation period is around 28–35 days, although most will kindle (give birth) at 31-32 days. A nest box should be provided for the new mother two to five days prior to the expected kindling date. The doe will pull fur from her abdomen and dewlap and along with hay or other materials provided she will create a nest. The young are born hairless, deaf, and blind. Fur begins to grow in by day 3 to 5 and after 7 to 10 days the kits' eyes will open by 2 weeks they may begin exploring and sampling outside food sources. At the age of three to four weeks their mother will begin to wean them off milk, meanwhile the kits will switch to eating hay and pellets. The average number of bunnies per litter is seven but commonly range from one to fourteen. Because rabbits are induced ovulators a doe can become pregnant by the simple act of mating if conditions are right. A doe can get pregnant within 24 hours after giving birth. Cannibalism is rare but can happen. In the wild it is a defensive mechanism to remove all blood and dead tissue from the nesting area to avoid detection by predators. If young are stillborn or die after birth, many times the doe will ingest the remains. Cannibalism can also be brought on by a severe lack of fluids and feed. Bucks have little to no part in raising the young. They do in some cases act as babysitters and a heat source for the young kits in group settings known as a colony. Contrary to popular belief bucks do not kill and eat kits under normal circumstances.